At the heart of every farm is the farmyard and no farm is complete without the buildings and accessories that your yard will need. 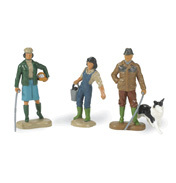 The Britains farm building set is a perfect start to a child’s collection and all you need to do is decide what you want to store in there. Perhaps it is simply a place to keep your various farm vehicles. At the end of a busy day, you can drive back to the farm from the fields and keep your tractors and trailers under cover until morning. 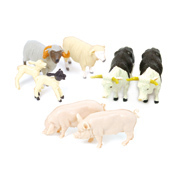 Or take a look at these other fantastic accessories for your farmyard. If you going to have these buildings then you are going to need some essential items for your farm to put in them! What type of farm are you going to have? Food would be a good start for a livestock farm and there is plenty of that. There are bales in all shapes and sizes for bedding up your animals and sacks of barley or wheat. They can be what ever you decide! You will probably also need some fences and maybe some pig huts so that your animals have somewhere to sleep and also to prevent them from running riot all over your farm. 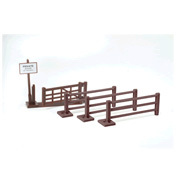 Don’t forget to add a gate into your fencing so that you can get in to feed the animals! If you decide that you are going to have an arable farm then maybe you will need some seed fertiliser or some potato boxes so that you are ready for when you harvest all those potatoes that you have planted. You will also need some bales so that when harvest comes you can stack them into the barn ready to sell and deliver to other farms that have animals. And every farm needs a family to look after all the vehicles and animals. What will yours be called?